You may be familiar with the TeachMeet concept, but did you know it was coming up for its fifth birthday? To celebrate, Ewan McIntosh has issued the #tm5 challenge – Ian Guest (@ianinsheffield) has a good post on it here: http://ianinsheffield.wordpress.com/2011/01/16/tm5/ . This challenge kind of merged with some thoughts I had had during the TeachMeet research I undertook last year – and during the #tmfuture discussion – about trying to extend the reach of TeachMeets beyond the predominantly ‘niche’ market of technophiles it had. I had heard people talking about how TeachMeets were just for those heavily into ICT, and whilst at the TeachMeets I have attended or heard of this is to a certain extent true, I felt that if this was allowed to continue it could become a hindrance. At the same time, I would not have wanted to risk upsetting anyone in the TeachMeet community – especially those who created the concept – and did not feel I could go ‘trampling’ over the conventions and guidelines they had set down for TeachMeets. However, when the opportunity presented itself to interview Ewan McIntosh about TeachMeet, it became clear that there was a recognition that TeachMeet had to change to evolve, and that far from discouraging this the TeachMeet community were ready and willing to engage with it. A number of changes began to show in various TeachMeets, including my own non-techie presentation at TMSEG10 (for which I was branded a ‘rebel’ by David Muir!) and slowly the idea of trying to organise a TeachMeet themed around outdoor learning started to grow legs and dance around my head. When the #tm5 challenge was thrown down by Ewan, and chatter started again about widening the TeachMeet ‘audience’, it seemed like an opportune moment to try it. I approached four colleagues to moot the idea, and was so encouraged by their positive responses I got to work on a wiki to help plan the event, which by this time had been christened ‘TeachMeet Beyond’ as it is about learning beyond the classroom. The wiki is a bit short on concrete details at the moment, but it has a number of suggestions and space to discuss them. So is this do-able? If it is to work, as with any TeachMeet, this event will need to be crowdsourced. Do you have something to offer? Could you get involved? Do you have any other ideas for venues/speakers/dates/sponsors(? ), or any suggestions at all? Please head over to the wiki and join in the discussion. TeachMeet – The Story So Far….. I was recently invited to write an article on TeachMeets for the School Leaders Scotland “Scottish Leader” magazine, and it was fascinating to do. I learned so much doing it, and promised to post the article on my blog (the article was produced under a Creative Commons Attribution Non Commercial Share-Alike license). With the #tmfuture debate starting off tonight, I felt it may be an opportune moment to post it – so here goes! TeachMeet – the story so far. But the signs are clear – that’s all likely to change, and probably very soon. There’s a revolution coming, and its name is TeachMeet. But what exactly is TeachMeet? Tim and Moby appear courtesy of BrainPop UK, all rights reserved. The best – and simplest – explanation I have heard of TeachMeet is the one given by Tim and Moby of BrainPop in their movie explaining what TeachMeet is: “It’s like Show and Tell for teachers.” That is to say, it is a model of Continuing Professional Development (CPD) which involves those attending as participants in delivering the training as well as receiving it. When signing up for the event, those who are willing to do so volunteer to give a short presentation on something they have been doing or finding out about, and at the event talks are selected totally at random. Generally at a TeachMeet, these presentations come in two lengths – 7 minute ‘micro’ presentations or two minute ‘nano’ presentations. This allows for short, dynamic delivery meaning that a greater number of presentations can be delivered in a short time, as well as reducing the likelihood of spectator disengagement; should a topic not be of interest to them, it is only a matter of minutes till something else is being discussed. Of course, if there is a presentation that doesn’t interest you or apply to you, there are loads of things you could do instead – you can always talk to the person next to you, check out the online tool the last presenter was talking about, tweet or blog your thoughts about the event so far or even grab yourself a beer and some nibbles. Perhaps you could even join the virtual participants of the TeachMeet in the FlashMeeting or video conference and say hello? All of these things are actively encouraged at TeachMeets – whilst somewhat less formalised than many other CPD events, TeachMeets aim to be equally effective, if not more so. From humble beginnings in Scotland during 2005, TeachMeet has both grown and spread very quickly. Originally running twice yearly (once in Edinburgh, once in Glasgow) there are now numerous TeachMeets each year; 2009 saw at least 20 TeachMeets , whilst there are already 20 TeachMeets run or planned for this year – and it’s only March. 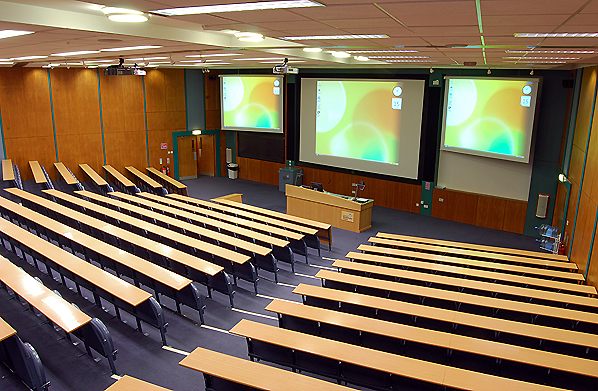 Similarly, whilst Glasgow and Edinburgh were the original venues, TeachMeets have now taken part in (amongst other places) Yorkshire & Humber, Sussex & Kent, Moosejaw in Canada, Galashiels, Stockholm, Orlando, Newcastle, London, Nottingham, Cheltenham, Falkirk, Wrexham, Blackpool, East Lothian, Stirling, Perth, Oxford…… the list goes on and on. There have also been TeachMeets run purely online, and also using mobile devices. There is even a virtual TeachMeet planned to run in Second Life. So where did TeachMeet come from? The idea originated with three Scottish educators – Ewan McIntosh, David Noble and John Johnston – who knew each other online, but had never met face to face until SETT (the precursor to the Scottish Learning Festival) in 2005. After their initial meeting, there was a desire to meet up again regularly to catch up on what they had been up to, particularly with regards to how they were using new technologies in education. When the eLive conference was going to be in Edinburgh in May 2006, another meeting was proposed and this time 10 people signed up (with another 8 sending apologies!) and in the Jolly Judge pub in Edinburgh a legend was born – although the name TeachMeet didn’t arrive till later. 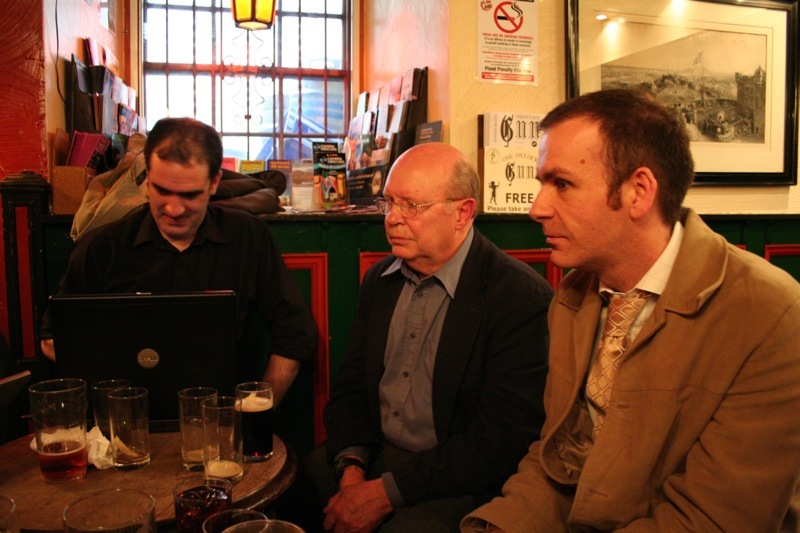 Both John and David are also keen advocates of the evolution of TeachMeet. “I think they are already becoming less techy and more about teaching,” says John. “Evolution needs different models to choose survivors from. I think the Islay conference sounded great, while TeachMeet Falkirk and TeachMeet East Lothian brought in a new local audience. I very much enjoyed Con’s LeadMeet.” David agrees. “I think anyone who is interested in the evolution of the TeachMeet idea should really go back and look at the LeadMeet which was organised in the middle of last year by Con Morris, around the Scottish International Summer School on School Leadership. Various things were tried out there which I found put a smile on the face of every participant for the entire night, just trying out some great new ideas for involving you, particularly in getting conversations going.” Given the success of LeadMeet09, be sure to keep your eyes peeled for LeadMeet10! And so the TeachMeet story continues. But there are challenges. John feels there is a danger that TeachMeet might be in danger of becoming too mainstream, not different enough, or too dependent on sponsorship. “There’s also the possibility that it might become too self congratulatory, self-satisfied and less innocent.” Ewan agrees. “When I’ve been running events it’s been as irreverent as possible, in a bid to distance itself from the hierarchies we’re used to, and the reason for doing that is to try and generate alternative discussion to what we’re used to.” He also feels that the TeachMeet ‘brand’ may need some protection from commercial exploitation, and is instead investigating ways to use the revenue generating potential of TeachMeet to further the model elsewhere in the world, places where having a TeachMeet would not be so easy, but that the benefits of such an event could be massive. “I think my main concern is that it needs to diversify beyond the very large, but still very ‘niche’ group that attend it.” says Ewan. He suggests a Jamie Oliver-esque ‘Pass it On’ approach, where anyone who has attended a TeachMeet has to bring three of their non-TeachMeet friends along to the next one. “If we all did that twenty five times over, we would have the whole of Europe having been to a TeachMeet, and that could be a very powerful thing for education.” Of course, if the leaders of schools were to take up the cause and organise school-level, cluster-level or authority level TeachMeets, that target could become a lot easier to achieve, so why not take up the challenge and help shape the future? Eylan Ezekiel, Chris Bradford, Tim, Moby and everyone at BrainPop UK for the Tim & Moby image, as well as their TeachMeet movie. Ewan McIntosh, Ian Usher and Mike Coulter for the use of their images, as well as David Muir, Robert Hill and Andrew Brown for saying it was OK to use the photo with them in it! Con Morris and Margaret Alcorn for the opportunity to write this. This is intended to qualify as my quickest blog post ever. 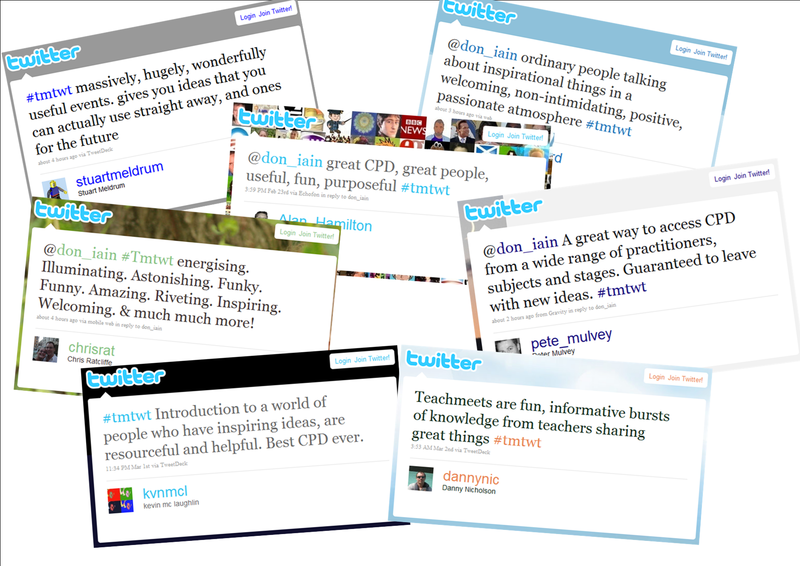 Recently on Twitter I have been collecting people’s feedback and thoughts about TeachMeet using hashtag #tmtwt. It has made fascinating – and inspiring – reading. Tonight I got a chance to gather it all together to make it accessible for those not on Twitter (and to make sure I can keep it!). I have saved a draft version to Slideshare, and am going to embed it below. View more presentations from Iain Hallahan.